The Cons Outweigh the Pros When Considering a Browns Trade for Odell Beckham Jr.
You can easily argue the Cleveland Browns and wideout Odell Beckham Jr. are a match made in heaven. While many fans (and players) are begging for these two to come together, I still can’t fully get behind the idea. On one side, you have an extremely talented receiver who’s fallen out of favor with his current team – the New York Giants – and is also demanding a contract extension. This has made the Giants consider trading Beckham, in part because the headaches he’s been causing have made them hesitant to keep investing in him. On the other, you have a team in the Browns making tons of moves in attempt to start stringing together some wins. After an incredibly active start to the month, Cleveland still has a ton of cap space and five picks in the first two rounds of the upcoming draft. So, sure, on the surface it’s easy to see why many are linking the Browns and Beckham lately. Adding him to a receiving corps featuring Jarvis Landry and (hopefully) Josh Gordon would be an astounding improvement to an offense which was mind-numbingly ineffective last season. One would think this would result in Cleveland transitioning from a league-wide laughingstock to potential contender seemingly overnight. Despite all of this, I still have concerns about this hypothetical deal going through. When it comes the idea of trading for Beckham, the cons are still outweighing the pros. For one, Beckham certainly won’t come cheap. This isn’t so much to imply he should, but more to nix the dreams of some Browns fans who think he could be had without giving up one of the team’s two first-round picks. There may be a chance the asking price comes down as we get closer to the draft. For now, though, any consideration for Beckham would have to be made knowing a prized asset will need to be included in the deal. After making peace with this, Cleveland will then have to determine if taking on Beckham’s talent is worth dealing with the trouble which comes with it. Outside of his play on the field, the Giants wideout is also well-known for having significant attitude issues. He tends to let his short temper get the best of him while on the field, as seen in his infamous run-in with former Carolina Panthers cornerback Josh Norman which netted him a one-game suspension in 2015. If he’s not taking frustrations out on opposing corners, he’s instead focused on punching locker room walls or kicking nets. This may seem minor to some, but it shouldn’t be completely ignored. Nor should a recent video clip he was spotted in, which featured him holding a brown cigarette sitting next to a woman and an unidentified white substance. While no conclusions have been made since, it’s difficult to argue the fact it’s a compromising situation for Beckham to be in. Team owner John Mara has already admitted he’s tired of discussing the behavior of his animated wideout, leading many to believe a trade is likely regardless of the Giants denying such a thing. At the same time, that New York may be willing to deal Beckham despite everything he’s contributing on the field should say a lot about just how much stress he’s causing. One would think this is something new GM John Dorsey would take into account when considering bringing Beckham into a locker room he’s been working hard to clean up. On top of this, the Browns already have a wild card in Gordon, who’s just one hiccup away from getting banned from the team again. Yes, in Beckham’s case, an argument can be made his talent would make enduring the migraines which come with it more bearable. You can also note that, due to Gordon’s status, Cleveland could use as much help at receiver as it can get. 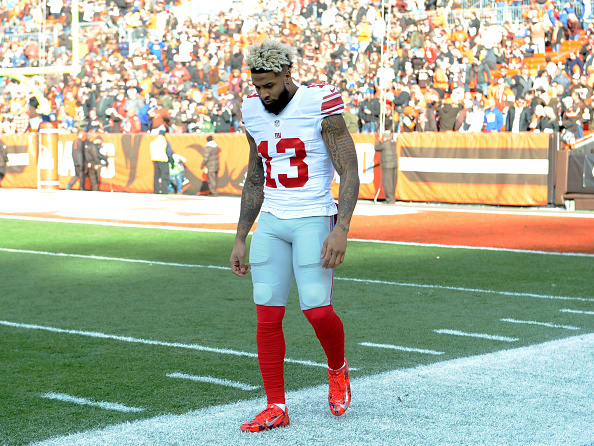 Still, there are too many red flags to be convinced the Browns going all-in on a Beckham trade is a good call. His talent is undeniable, but he’s currently on a team which may be willing to get rid of him despite it. With the Browns making another valiant attempt to stay on the straight and narrow, ponying up prized assets for someone who may end up rocking the boat should be avoided. Posted in NFLTagged Cleveland Browns, John Dorsey, John Mara, Josh Gordon, New York Giants, Odell Beckham Jr.